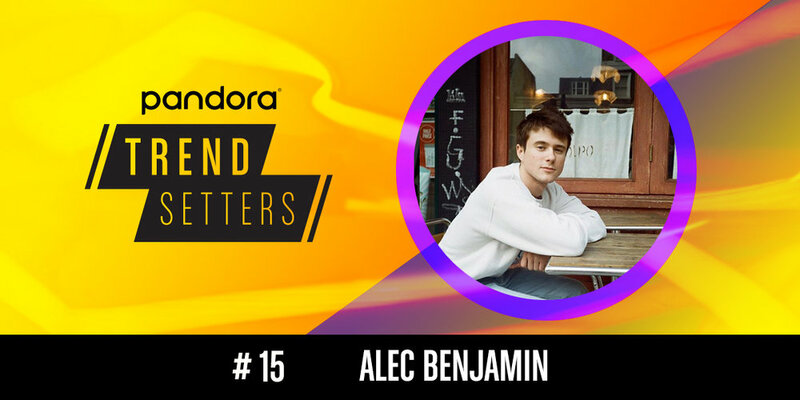 Our Trendsetters chart is getting a shake up thanks to the debut of Rainbow Kitten Surprise and Alec Benjamin! Take a listen to their artist stations on Pandora today! Considering Rainbow Kitten Surprise spent six weeks this spring on the Pandora Predictions Chart -- peaking at #2 -- this isn't all that much of a surprise. The indie rock band from North Carolina makes their Trendsetters debut this week with over 2,000 weekly artist station adds as they hit the road to support their latest album, How to: Friend, Love, Freefall. The most popular track from the album so far is "Fever Pitch," which is quickly approaching 1 million spins on Pandora. 24-year-old singer-songwriter Alec Benjamin has managed to make quite the name for himself without having released an album. After the success of his 2014 single "Paper Crown" and 2016's "End of the Summer," he debuted on the Pandora Predictions Chart in late 2016. Now, he makes his Trendsetters debut following the success of "Let Me Down Slowly," which is seeing around 200,000 spins per week on Pandora. Apparently Benjamin's got plans for an album, too, so expect to be hearing more from him.